Description: This essay on Soren Kierkegaard and economic matters from a theological perspective is well grounded in the Dane's journals. In these writings, the late nineteenth-century thinker shows his solidarity with rural residents (90 percent of the population) and urbanite menial workers. Topics include the option for the poor; the ideology of impotence; the denouncing of a competitive society; the correlation of wealth and poverty; media, church, university, and theater as social institutions shaping reality; Christendom; and the retribution doctrine. A Vexing Gadfly develops the theological themes within the timeframe of ""Golden Age Denmark"" (1800-1860), which includes the period of Denmark's colonial activities. The historical approach adds flesh to the bones of abstract thought and ahistorical doctrines. Contrary to common belief, Kierkegaard did articulate economic issues through structural categories such as the age, the pyramid, the building, the external revolution, ""the Fire Chief,"" and his diagnosis of society. Ironically, the domestication of Kierkegaard's economic thought took place from the time of his death on November 11, 1855. His eulogy took place at the most important church of the country, the Church of Our Lady in Copenhagen; his burial at Assistens Cemetery was with full pomp; and by 1971, his statue joined the select club of Mynster, Martensen, Grundvigt, et al., as they surround the wealthy Marble Church. 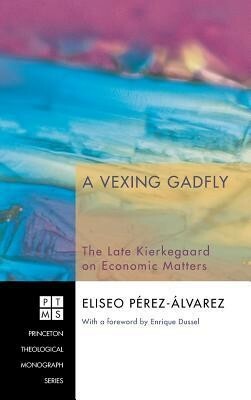 Endorsements: ""Finally After decades of reading and interpreting Kierkegaard as the solitary--and somewhat eccentric--knight of faith, Perez Alvarez calls our attention to a different Kierkegaard, one deeply engaged in the economic and social issues of his time. In presenting a hitherto discounted and almost unknown Kierkegaard, this book not only corrects much of our traditional understanding, but also leads one to wonder why in the twentieth century we became so enamored with what was clearly a truncated view of the great Danish theologian."" --Justo L. Gonzalez, author of A History of Christian Thought ""A Vexing Gadfly is an extraordinary presentation of the radical economic, social, and political views of the later Kierkegaard as he prophetically and vehemently castigated the nineteenth-century Danish church, state, and their theology and ideology. Dr. Eliseo Perez-Alvares captures Kierkegaard's penetrating critique of the social-economic oppression of the marginalized with its relevance for contemporary theology. The cutting irony of a nineteenth-century Dane becomes a powerful voice through a twenty-first-century liberation theologian."" --Mark Thomsen, Lutheran School of Theology at Chicago Perez-Alvares presents us with a Kierkegaard that is little known: a theologian connected to his time of profound social changes, which takes the side of poor people and produces keen theological reflections regarding economy. Our time is also marked by crises and economic changes that affect the lives of millions of persons. What does Christian theology have to say to the world today? This book is a valuable contribution in the elaboration of this response. --Jung Mo Sung, author of Desire, Market and Religion About the Contributor(s): Eliseo Perez-Alvarez is Associate Professor of Contextual Theology and Praxis at the Lutheran Seminary Program in the Southwest in Austin. He is the author of We Be Jammin: Liberating Discourses from the Land of the Seven Flags, The Gospel to the Calypsonians: the Caribbean, Bible and Liberation Theology, and Comentario de Marcos"
I'm the author/artist and I want to review A Vexing Gadfly.